We’re regularly asked by our customers how many pages a given cartridge should print, to which the answer is however many sheets at a five percent yield. Not many people know what this 5% figure means, so read on to learn where it came from, what it means and the implications for your printing. Where did 5% page coverage come from? The ISO (the International Organisation for Standardisation) set this 5% measurement to help manufacturers state how many pages their cartridges could print. They created a standard document to measure print yields across various printers, so any new cartridge is run through a printer in specific printing conditions and will print until it is empty. This total number of pages is the number you see on our website for yields. This document is the ISO/IEC 24712:2006 (now revised as the ISO/IEC 24712:2007). This 5-page document consists of different designs of common printed pages, such as a letter, a presentational document etc. Interesting fact: There's no standard for photo printing, and the documents they print includes no photo. This is why you'll never find a photo cartridge with a yield, as their life depends entirely on what your photo is made of. What do these 5% standards tell you? Because what they are printing is standardised, the 5% figure allows you to compare page yields between manufacturers. Before this standard you couldn't compare the yield of an Epson vs a HP cartridge as they were calculated differently. Now they're the same and you can compare. e.g. a HP ink quotes 500 pages and costs £10. Epson quotes 500 pages for £5. You know they were both measured the same way, so the Epson cartridge costs half as much to run and is better value. Whilst you should only use this as an estimated figure, it means you can compare running costs of cartridges and know if cartridge A is significantly more expensive to buy and use than cartridge B. This is why we have running costs already calculated on our website for you, to make it even easier. To make sure results were consistent, we used the same sentence repeated as many times as necessary (The quick brown fox jumped over the lazy brown dog). This means that a standard sheet of five percent is in the region of half a page of normal sized text. 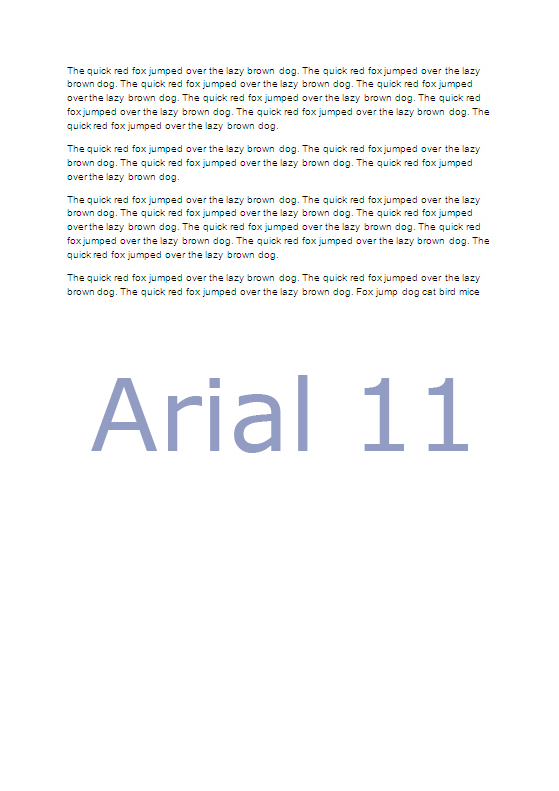 The previous images highlight the difference fonts make in yield, and when you combine it with different font sizes it makes even more of a difference. We looked at Arial and Times New Roman for everyday use, Calibiri because it’s what MSWord loads with, Comic Sans because teachers use it, and Tahoma, because it’s quite common, apparently. 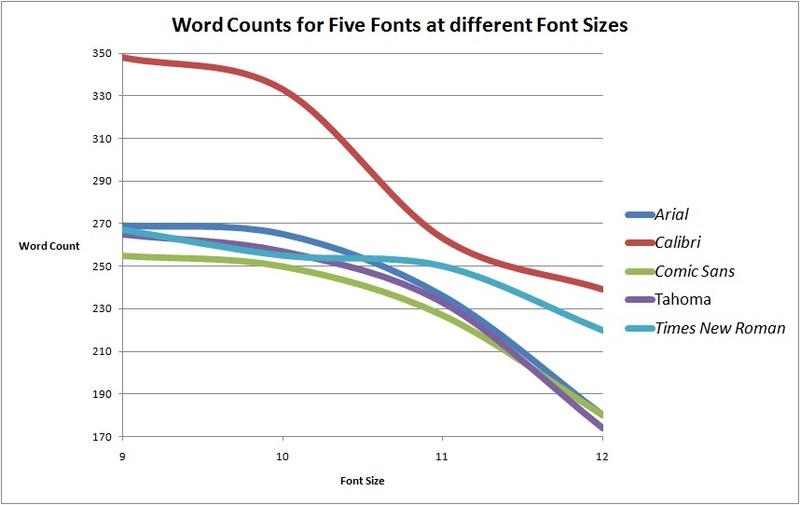 It’s pretty obvious to see that Calibri (the red line) is the best font at all tested sizes, while Arial, Comic Sans and Tahoma all performed similarly. 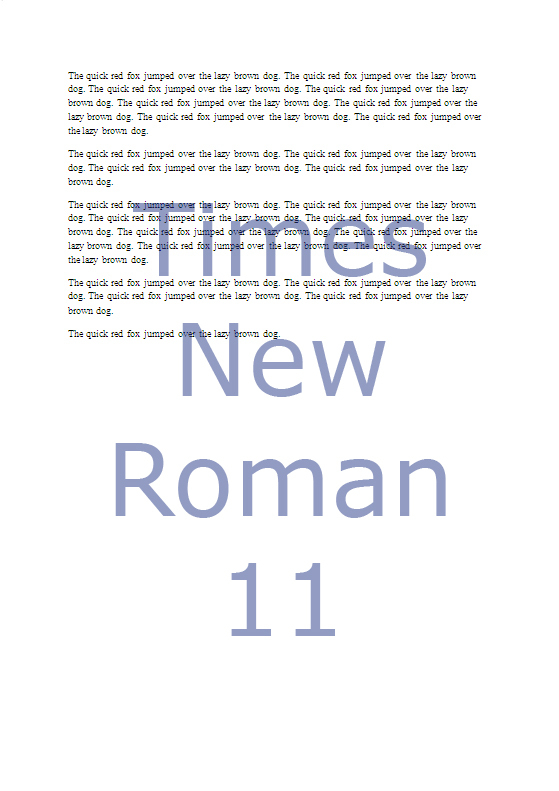 Times New Roman was an oddity in that its change from size ten to eleven barely decreased at all, making it good for larger font print jobs. What about spreadsheets? A simple numeric table, with 9 columns, 45 rows and 405 cells as standard uses 5.55% of the page without borders. Add borders & you use nearly double the ink, at 10.89%. 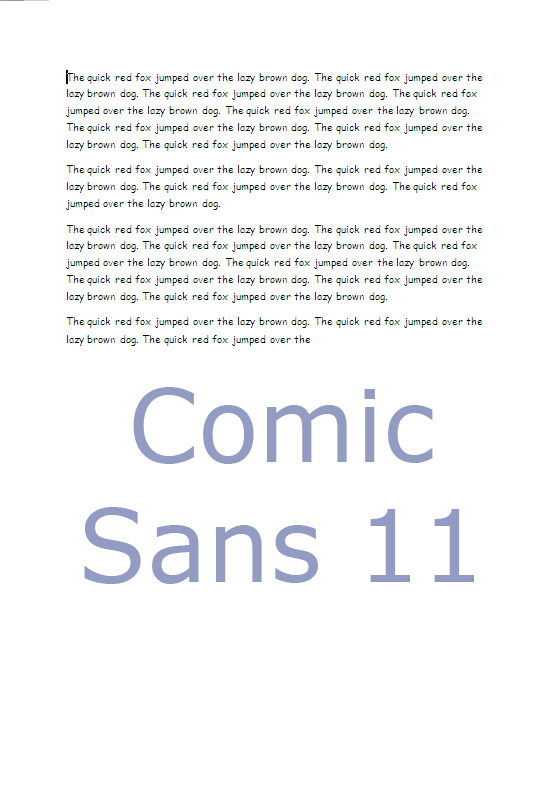 So, next time you receive a borderless table with Calibri font, you know someone has been reading our work!